How do I use this Extension? Now that you are familiar with the Extension, it is time to deploy it and give it a test run. The following FAQ article will explain the process from deploying the Extension to using it for the first time. Name: Enter an easily recognizable name for this record that will be used for selection in the extension. Description: Optionally enter a description for this record. The description will not appear in the Extension. URL: Enter the URL to the login or signin page that contains the web login form. User: Enter the username to be populated. Password: Enter the password for the username. 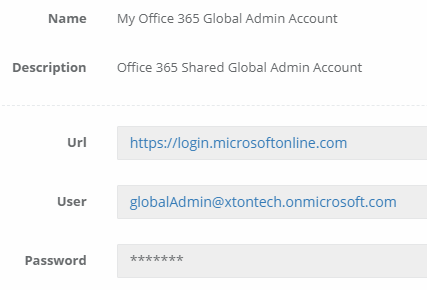 A WEB Portal record created in XTAM server to auto-populate a Microsoft Office 365 or Azure login. Once the record is created, share this record with a user or group with at least the Unlock role. 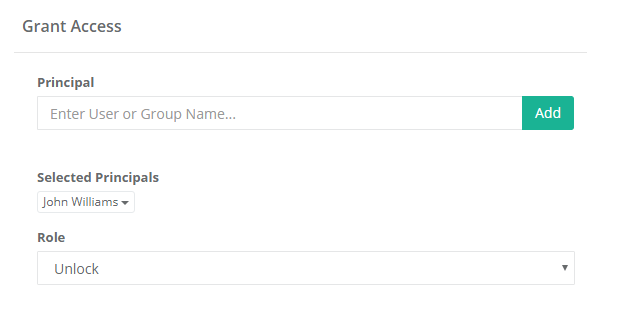 You may now configure XTAM to include users with Viewer permissions. Share the record with at least the Unlock role for others to see it in their Extension. In either Mozilla Firefox, Google Chrome or Opera (Microsoft Edge coming soon), open the Extension store and add the Xton Access Manager extension to your browser. When the Extension is deployed, locate and click the Xton Access Manager extension in your browser window to open it for the first time. Browser Extension location in default configurations. Mozilla Firefox (top), Google Chrome (middle) and Opera (bottom). Enter or copy/paste the URL to Xton Access Manager into the field and click the Login button. The XTAM URL is the one that is used to initially login to the system. The default URL is http://localhost:8080/xtam but often times this is modified. If you are unsure, please contact your Xton Access Manager Administrator for assistance. 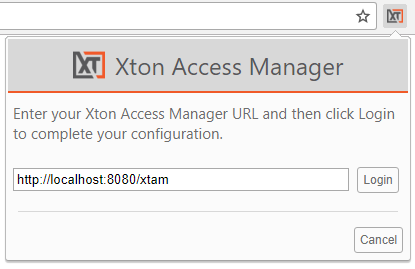 Enter the Xton Access Manager URL and click Login. A new browser tab or window will open and load the Xton Access Manager login page. Enter your XTAM username and password and then log in as usual. Once logged into XTAM, you may close this browser window or tab and return to your previous. Open the Extension again to load your records. In the Extension, select the record and then click the web page’s login or signin button to complete the login procedure. If only one record for this login was found, the Extension will automatically populate the credentials once opened. If two or more records are found, then you must choose and click the Record Name to populate the desired credentials. A user’s view of one record displayed in the Extension (left) and multiple records (right). And that’s it. You can continue to create additional records in XTAM server for other web portal login forms and share these with your users and teams.